MIXO Modular Inserts are resistant to mechanical stresses. Available with types of connections ranging from small signal connectors with low amp and voltage, up to 200 amp connectors, MIXO Modular Inserts are mounted side by side and locked into metallic frame. Each insert is designed to fit and lock into frame sizes ranging from 1 module to 12 modules. Housing signal, power, data and pneumatics contacts for conduction with up to 8 bars pressure compressed air, product meets UL 94-V0 standards. 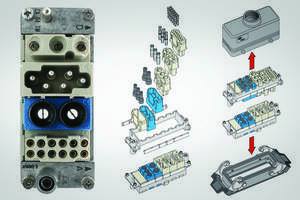 The Mencom modular insert series (MIXO) was designed to allow different types of connections housed in a single traditional rectangular enclosure. The types of connections range from small signal connectors with low amp and voltage, up to 200 amp connectors. Since each insert is designed to fit and lock into a frame that ranges in size from 1 module to 12 modules in a single enclosure, the possible combinations are countless. Each enclosure can house signal, power, data, and pneumatics contacts for the conduction of compressed air with pressure values of up to 8 bars. These inserts are mounted side by side to form a single compact block that mounts and locks into a metallic frame with included locking tabs. The modular system provides an easy and quick access to a series of contacts installed in the frame without disassembling the entire connector. The MIXO modular inserts are extremely resistant to mechanical stresses (vibrations, shock and cable loads) and corrosions (gas-tight) to provide secure and stable connections. They are UL 94-V0 approved and built in self-extinguishing thermoplastic material reinforced with glass fiber. The MIXO series frames can be used in housings ranging from, standard classic, to aggressive environments, high temperature, IP68, and more. Please visit https://www.mencom.com for more information.